Peruvian Airlines has signed a letter of intent with Russian aircraft manufacturer Sukhoi Civil Aircraft (SCAC) for the acquisition of Sukhoi Superjet 100 (SSJ100) regional jets and MC-21 advanced narrow-bodies. The document covers a total of 20 aircraft, 10 of each type, SCAC says in a statement. The Peruvian carrier, which currently operates a fleet of a dozen older-generation Boeing 737CLs, has voiced its intent to launch a subsidiary operating Russian-made aircraft both domestically and internationally. The provisional plan is to start operations in the 2020/2021 period and operate the aircraft on flights to Chile, Bolivia, Paraguay, Uruguay and Brazil. The acquisition prospectus was signed at the UK’s Farnborough Air Show by Alexander Rubtsov, president of the Sukhoi Civil Aircraft Company (SCAC), and Cesar Cataño, founder and shareholder of Aeroperu International, who is also founder of Peruvian Airlines. Following its plans for a strategic business expansion and for the extension of its route network, Cataño and other shareholders of the Peruvian company have been studying the market availability of different aircraft types. From his personal experience of travelling on the SSJ100 and with positive feedback from “other Latin American operators” – a reference to Mexico’s Interjet, the continent’s only Russian regional jet operator – Cataño “took a personal interest in the SSJ100 aircraft”, a Sukhoi statement explains. For the carrier’s future routes with extended passenger flows, the possibility of “purchasing MC-21s might also be considered”, the manufacturer adds. Latin America is one of SCAC’s priority markets. A successful example in the region is the continuing deliveries of 30 SSJ100s to Mexico’s Interjet, which is the largest operator of the Russian-made regional jets outside of Russia, with 22 aircraft delivered to date. 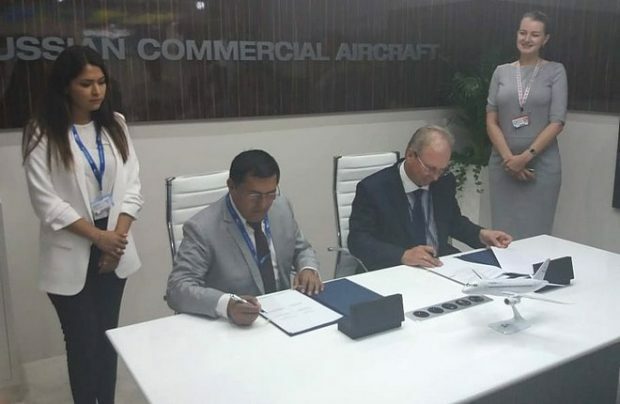 Previous letters of intent for the SCAC aircraft were signed in April with Aero Mongolia requesting two SSJ100s; and two Iranian operators, Iran Aseman Airlines and Iran Air Tours, considering a combined possible total of 40 SSJ100s. The collective global fleet of SSJ100s currently amounts to 133 aircraft, 99 of which are operated in Russia. Since the beginning of this year the original equipment manufacturer has delivered eight aircraft. Deliveries last year reached 30 units.